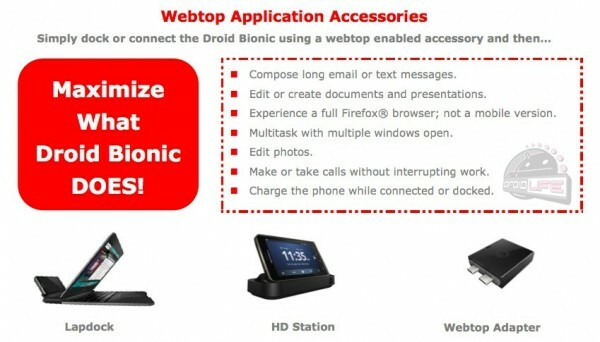 Tuesday Poll: Interested in DROID Bionic Webtop Accessories? When the Atrix 4G was introduced at CES in January, one of the major selling points was its built-in webtop docking capabilities. The idea that your phone could essentially turn into and power a laptop, was pretty intriguing. The pricing on the other hand, not so much. With the release of the DROID Bionic, Motorola has introduced similar webtop accessories but, also has plans to throw in a new “Webtop Adapter” that is targeted at customers who want to experience webtop on the cheap. We are just wondering if anyone is interested in this type of accessory at all? Current signs point to the full LapDock as being priced at $299 with the HD Station and Adapter falling in somewhere below that. You definitely have options – are you looking to jump on any? Interested in a Bionic webtop accessory? Not interested in Webtop accessories. Waiting for initial reviews of each.